On this morning's walk we were overtaken by women and children in their finest. 'It's a celebration,' they said hurrying past. Last night’s news came to mind and we asked the next rushing passer-by if it had something to do with the Hajj. 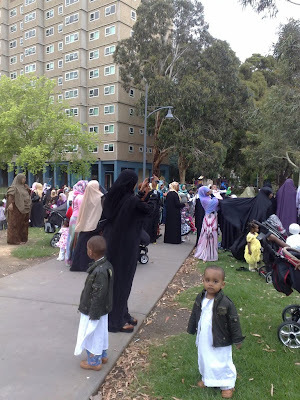 'Yes, Hajj celebration,' as she jogged past with her kids towards the massive congregation on the lawns outside the flats. The smile on her face – whether at our interest or our ignorance – seemed to invite us to find out more, we followed into the worshipping. Eid-el-Adha (Festival of the Sacrifice) celebrates the end of the Hajj, or the pilgrimage that Muslims are encouraged to make once in their lives. Lasting around three days, the festival commemorates Ibrahim’s willingness to sacrifice his son for Allah, and observances include prayer, alms for the poor and sacrificing a goat, camel or sheep. 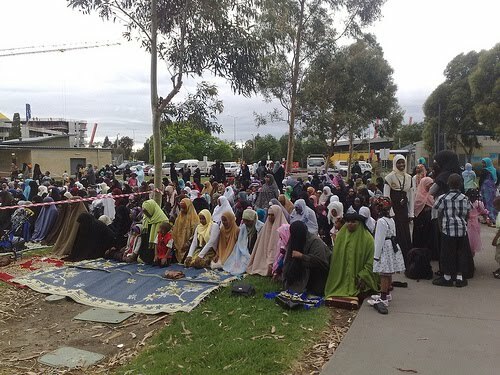 Here in Flemington, there was sombre intoning from the Iman, prayer and a sermon, collection tins, but thankfully no livestock in sight. Although given the site of the celebration, Debney Park, used to be an abbatoir there may have been a sacrifice in the past. Towards the end of the sermon, or maybe the repeat of it, where the Iman had slipped from Arabic to English, celebration was definitely in the air. Kids were buzzing, teens were preeni ng and there was a great sense of catching up with friends and neighbours. To one side of the mass prayer site, a mini carnival has been set up. Dodgem rides for Allah, anyone? Posters at the community centre say the celebration lasts all day, so I might make my way down for lunch or a whizzy ride. A guest post from Ms. Hackpacker. Very interesting indeed. There were a few African Muslim families picknicking and barbecuing tonight in the Yarraville Gardens. I wonder if that had anything to do with Eid celebrations. You have enlightened me. Was there a similar gathering of men nearby? It seems to be all women and kids. Is it mainly celebrated by women?